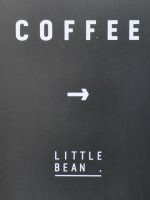 Finding today’s Coffee Spot, Little Bean, was a combination of good luck, guesswork and determination. I first came across Little Bean’s coffee at AUNN Café & Co. on my first trip to Shanghai in October 2016. Back then I was told that the roastery/coffee shop was in Pudong, so when I found myself back in Shanghai the following year, staying/working in Pudong, I was determined to track Little Bean down. Although I didn’t know it at the time, Little Bean occupies a unit in an outdoor mall on Jinyan Road, across the river from Century Square. A spacious coffee shop, complete with a dinky Probat roaster behind the counter, occupies the ground floor, while upstairs there’s a training school and on-site bakery. 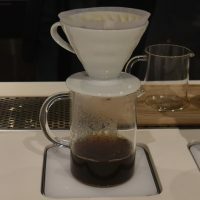 Turning to the coffee, Little Bean has a pair of single-origins on espresso (it also has two espresso machines, but I never worked out if the machines/origins were paired in any way) and another five on pour-over through the V60, plus you can buy the beans. As well as freshly-roasted coffee, you can have freshly-baked bread, with a wide variety to choose from, including croissants and various pastries. Finally, there’s a very tempting array of cakes/desserts to choose from if you want something sweet.